It took nearly half a year to reach the App Store, but Slacker Radio 2.0 is finally available for the iPhone and iPod touch. The Slacker service competes in the same streaming radio space as Pandora, though this major 2.0 upgrade brings a new trick to the table: offline caching of radio stations. Slacker Radio is a personalized, streaming radio service for iPhone, iPod touch, Android phones, BlackBerries, Palms, Sony TVs, and even some Blu-ray players. Just in time for AT&T’s money-saving-but-less-bountiful new data plans, Slacker’s new iPhone OS client allows for offline caching of up to 25 radio stations (for the detail-conscious: Slacker’s streams are reportedly 40Kbps AAC for mobile clients, and 128Kbps for desktop Web players). 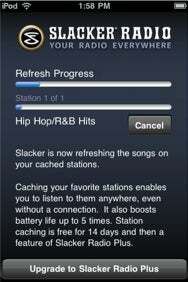 Slacker Radio is free to download and use, though a Slacker Radio Plus subscription is required to enable caching. You can purchase month-to-month subscriptions for $5 or a yearly subscription for $48 from Slacker’s site. The iPhone client also strangely offers a four-month deal for $20, which doesn’t actually save you any money. Unfortunately, Slacker does not specify exactly how much time or space its new iPhone client has to store those 25 stations. Many caching-enabled iPhone apps (such as Apple’s own iDisk app) let users choose how much data to store, though, so Slacker 2.0 should have plenty of room to let you rock through your day. Slacker Radio 2.0 is available now in the App Store and requires iPhone OS 3.0 or later.